The Snowman is a children's book by English author Raymond Briggs, published in 1978. It is the tale of a boy who builds a snowman one winter's day. That night, at the stroke of twelve, the snowman comes to life. In 1982, this book was turned into a 26-minute animated movie. It was first shown on Channel 4 late on Christmas Eve in 1982 and was an immediate success. The film was nominated for the Academy Award for Animated Short Film in 1983. It has been shown every year since and has become a part of British and international Christmas popular culture. 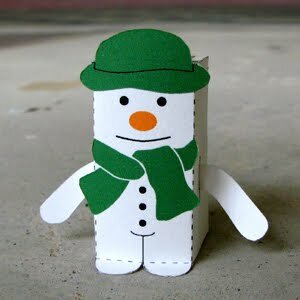 Download the PDF file here and make your own Snowman! Also check out our last Christmas's special, Jack Skellington as Santa! The snowman is great! The links to Jack and Santa don't work, though. Do you think you'll be putting those up again soon?